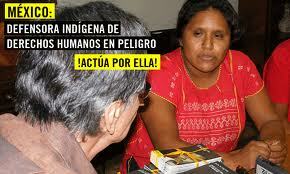 The National Network of Communication and Urgent Action for Human-Rights Defenders in Mexico has condemned the new death-threats directed against human-rights defender Obtilia Eugenio Manuel, president of the Organization of the Me’phaa Indigenous Peoples (OPIM), based in Ayutla de los Libres. An anonymous letter was found at midday on 11 February in the OPIM offices which said that “You Obtilia are enjoying precautionary measures, but no matter we will beat you Obtilia and Cuauhtémoc, as you are the leaders… The Inter-American Commission on Human Rights does not protect you from bullets.” It should be remembered that she and all OPIM members enjoy precautionary measures, as awarded by the Inter-American Court on Human Rights (IACHR) in 2009. The death-threat, as asserts the communique, makes mention that it is not clear that it was soldiers who raped Inés Fernández Ortega, a Me’phaa indigenous woman and member of the OPIM who took her case before the IACHR. The IACHR in turn released a sentence of condemnation for the Mexican State in October 2010. This entry was posted on Tuesday, February 26th, 2013 at 2:26 pm and is filed under Guerrero, Human Rights, Human Rights Defenders, Indigenous people, Justice system, Militarization, Paramilitary, Women, Youth. You can follow any responses to this entry through the RSS 2.0 feed. You can leave a response, or trackback from your own site.